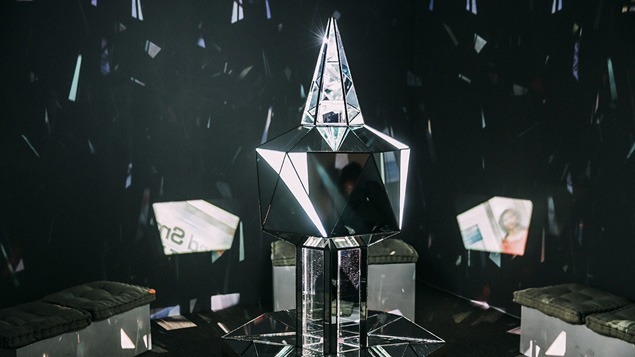 Beautification Machine is an experiential artwork infused with mysticism and opacity. In the words of the artists, Diaz Hope and Bernson, Beautification Machine is a device used to “neutralize the bile and fear spewed forth daily over the networks and transform polarizing media sources into vehicles of contemplation and peace.” The work combines functions of sculpture, projection, audio processing and random chance to manipulate real-time audio and video feeds from FOX, MSNBC or any other news source, and then strip them of all rhetoric and partisanship. Beautification Machine’s essence is antithetical— an oasis of calm created from the very thing that makes it difficult to find serenity in the modern world. The artists hope viewers will begin to break patterns of fear and paralysis instilled by the media and find ways to enact positive change. Beautification Machine is a humorous attempt to counteract the voices of partisan pundits, “masquerading as news analysts,” who subvert civil dialogue. Diaz Hope and Bernson describe “the miracle” of the piece as the meditative environment naturally generated by the removal of divisive elements—fear replaced by empathy, mutual understanding and a sense of calm. Diaz Hope and Bernson profess they will closely guard the secret machinations of their work for fear that the mainstream media will “surely attempt to steal the device” for malevolent purposes. Though transparent as whimsical exaggerations, the artists’ statements bring a humorous brand of paranoia, magical thinking, and antiauthoritarianism to the overwhelming media presence in the modern world.